Being promoted to regional manager of Dunder Mifflin Scranton was the worst thing that ever happened to Michael Scott. As evidenced in The Office’s first three seasons, being named the boss confirmed to Michael what he’d believed all of his life: That he was special, that he could command the attention of a room, and that he was born to lead. But none of that is true, and that’s the funny thing about the first three seasons of The Office. These are beliefs that Michael holds, with only some of the talent to back them up. If he ever commands a room, it’s usually in the opposite spirit from which he intended, as when he steps on the toes of the minister in “Phyllis’s Wedding” and loudly presents Phyllis and Bob as husband and wife for the very first time. Unfortunately, the wedding vows are only half complete at that point of the ceremony. Between episodes, Phyllis makes a mistake similar to the one made by the unseen Dunder Mifflin higher-ups who hired Ed Truck’s replacement: She shows a small courtesy to Michael, which Michael interprets as a spotlight. “Phyllis’s Wedding” and “Business School” make for a fine double feature, because the basic DNA of the episodes’ A-plots are identical: A Dunder Mifflin employee intends to use the boss to their advantage, and those intentions blow up in their faces. In order to get a six-week honeymoon, Phyllis must first endure a wedding that’s at the mercy of Michael Gary Scott. In order to receive extra-credit in a business course, Ryan has to sit through the latest collection of mundane observations and hyperbolic clichés that Michael fashioned into a speech. There’s a tremendous prelude to the “Business School” address in “Phyllis’s Wedding,” as a talking head lays out the principles of the Michael Scott School of Public Speaking: If time isn’t a factor, try out a handful of openings. They’re the most important part of a speech! Phyllis was the ideal first Office supporting player to get married, because the show could stage her wedding and make the whole event about other people. At this point in the series, Phyllis isn’t a full enough character to carry a plot on her own, and so the biggest day of her life becomes the biggest and most disastrous days of her co-workers’ lives. Primarily her boss: So outrageous is Michael’s fear of missing out (he’s only been to one other wedding in his life, during which he peed his pants and fled) that he tries to leech all of the “iconic” matrimony moments from Phyllis and Bob. He wants everyone’s attention as he walks Phyllis’ dad down the aisle. He wants to give the rambling, punchline-packed toast that has his fellow guests squirting white wine out of their noses. (As Michael demonstrates in “Phyllis’s Wedding,” the nose is important to determining white wines from red wines.) He wants someone else to smash a piece of cake into his face. Delightfully, he gets to fulfill someone else’s wedding-day fantasy: In these attempts to steal the show, he morphs into the party crasher sought by Dwight (but only after the idea is planted by Jim). “Phyllis’s Wedding” is a 22-minute distillation of Michael’s entire Office arc, in which he lets power go to his head, gets smacked down for being a selfish jerk, and then redeems himself. “Phyllis’s Wedding” is also the closest this Office would ever come to simulating an honest-to-goodness documentary, its many wedding-day vignettes assembled into a loose-but-evident narrative. It really does feel like the most awkward wedding video ever made, with the regulars’ periodic confessional check-ins standing in for videotaped well-wishes for the happy couple. A party is the perfect setting for this type of episode (you can rope “Christmas Party” into the conversation as well, thought that episode feels like it has a more traditional, rigid narrative structure to me), giving The Office a central event through which it can route multiple storylines. Caroline Williams’ script is a delicate act of keeping several plates spinning in the air, one that required Ken Whittingham to play traffic cop as much as director. The reception hall is a fun space for the show to explore, with the camera keeping a Dwight-like eye on the proceedings while allowing multiple storylines to merge within a single shot. My favorite example of this comes when Pam gets fed up with attending a wedding that looks and feels like the one she was planning for herself and Roy. 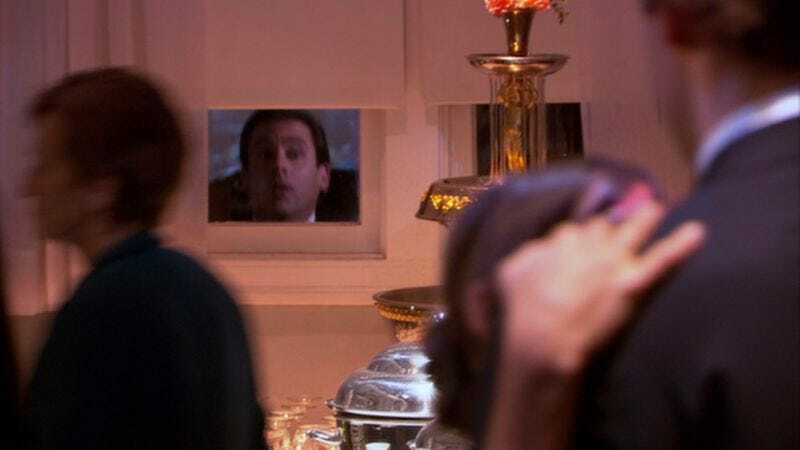 As Jenna Fischer ducks out of the room, the camera pans back to a window just long enough to show Steve Carell’s head bobbing in and out of view. It’s tragedy, it’s comedy, and it’s a great visual gag: Both of these characters are outsiders looking in on an event they feel should’ve been theirs. Long-running TV shows tend to go to the wedding well again and again; following “Phyllis’s Wedding,” The Office would go there two more times for two landmark episodes. But it would never explicitly portray the wedding that’s being yearned for the hardest: Michael’s. Like his promotion from sales to management (and unlike Phyllis’ swiping of Pam’s wedding plans, the seeds of which are sprinkled throughout season three) we didn’t need to see it to understand its import and its consequence. The Documentarians catch a lot of stuff—like Pam and Roy heading into the night during, appropriately, the voyeurs’ anthem “Every Breath You Take”—but their gaze isn’t omnipresent. In those cases, it’s on the characters and the actors to put their feelings out there by blurting them out or acting inappropriately—the Michael Scott special, so to speak. A wedding is the perfect occasion for both of those actions, and “Phyllis’s Wedding” uses that occasion to great success. The cold open, with Jim ensnaring Dwight in a long-con Pavlovian prank, is one of the show’s all-time greats. Rainn Wilson plays unwitting (and then perplexed) so well, and the fact that Jim can’t be bothered to remember the name of Ivan Pavlov—perhaps humanity’s most prestigious dog-related scientist (non-veterinarian division)—speaks volumes about the character. “Phyllis’s Wedding” gives us Michael Scott as wedding crasher, and then “Business School” follows that up with Michael Scott as Archie Bunker. That’s undercutting the notion that we’re seeing Michael at his very essence in these episodes, but it’s the best shorthand I can come up with. As All In The Family does so many times to the bigoted curmudgeon at its center, “Business School” forces Michael to confront a worldview outside his own, with hysterical results (and reactions). In neither case does the character truly change; that’s not what TV does on an episode-by-episode basis, and to suddenly remove Michael’s overall optimism and “Little Engine That Could” spirit toward selling paper would remove the attributes that separate him from a genuinely ignorant guy like Archie. But as long as the show has him on the spot, “Business School” sits back while Michael endures a meltdown of Bunker-esque proportions. The speech that Michael gives to Ryan’s emerging-enterprises class is a one-man circus of the out-of-touch, three rings in which Michael’s parlor tricks and derring-do demonstrate how Dunder Mifflin wound up in this downsizing mess. Ryan could (and does) tell his classmates that the company is unwilling and unable to adapt to a changing marketplace, but the slow descent into madness that Michael undertakes is a more powerful way of showing that unwillingness and inability. From one cut to the next, Michael’s whole body language changes, with his tone moving from faux-encouraging to genuinely defensive. It’s a major showcase for Steve Carell, occupying the entire second act of “Business School”—which is then intercut with the rising action in the office’s battle against a stray bat. But that fits just right, since what occurs in front of that class is metaphorically Dunder Mifflin swatting at adversaries who can fly way, way over the company’s head. It is an impressive display: On this rewatch, I found myself slack-jawed at how deep Carell gets into Michael’s “saying something without saying anything” style. To continue mixing metaphors brought up by the episode, it’s a David-and-Goliath setup, in which the lone spokesperson for an intuitive and practical approach to conducting business is no match for the bellowing voice of case studies, theoretical, and the Herfindahl index. There’s no clear winner, just a mob with a tremendous amount of ammo backing a startled creature into a corner. And that’s how we get back to the bat; the only difference between it and Michael are the opposable thumbs that let the latter storm out of the hall in a righteous huff. They’re strangers to these surroundings, Michael and the bat—and yet they share a lot in common with art-student Pam at her art-school art show (art show title: Artists For Art), a generally undercooked C-story that’s part of a larger season-three game. There’s a lot of talk about talent and abilities in “Business School,” which is an episode partially about the things we can and can’t teach ourselves. 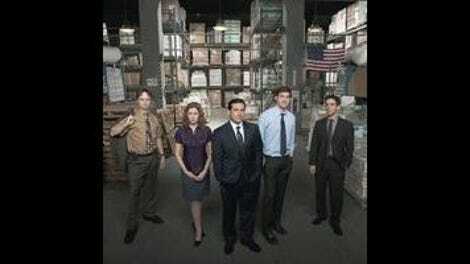 With more training and focus, it’s likely that Pam could’ve progressed beyond what Gil dismisses as “motel art.” Ryan, on the other hand, doesn’t have the people skills to be an effective salesperson—the spectacular fall that Michael takes in front of the emerging enterprises students is partially the result of an underhanded setup from Ryan. He lacks the empathy that makes Michael an inspiring leader. The boss should keep his mouth shut more often, but every once in a while, that constant stream of bad jokes, misattributed information, and banalities produces a warm and uplifting sentiment. There’s honesty in that scene at the art show between Michael and Pam, the kind the tempers what she overhears between Gil and Oscar and comes across more genuinely than Roy’s “Your art was the prettiest art of all the art.” It’s the kind of know-how that Michael picked up in the field. These individual triumphs over naysayers and foreboding villains (Big Bads, perhaps?) are the under-the-surface qualities that mark “Business School” as a television work from Joss Whedon—though they’re more typical of material that Whedon writes, rather than directs. These big-name-director episodes of season three are such a strange quantity, because TV direction is by and large an anonymous game. (A show like Glee, for which Whedon also helmed an episode, would be more inclined to court TV stylists, because it has a more flexible visual palate with its music-video sensibilities and utter disregard for anything approaching consistency.) So the script, by Brent Forrester, leads the way, allowing the director to try his kinetic hand at a few pseudo-action sequences, while also overseeing scenes that nod toward vampiric lore. “Business School” is The Office flexing its cult-show bona fides, while fundamentally remaining the show that garnered that cult in the first place. It’s a situation that’s more welcoming to outsiders than the stories it tells. The episode opens on a fantastically underplayed joke, in which Kevin’s traumatic ride to the office—something else The Documentarians didn’t catch this week—is bulldozed by Michael’s news about the guest-speaking gig. Fun with visual juxtaposition: Michael says “Real business is done on paper, okay? Write that down.” Whip pan to: Risers full of students typing on laptops. The Office: "Dunder Mifflin Infinity"